Secret History of the United States Peter Kuznick and Oliver Stone collaborate on Showtime TV series. 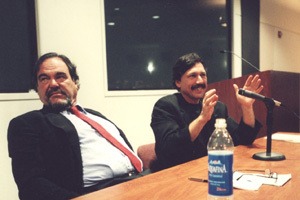 Peter Kuznick (right) with Oliver Stone. Department of History professor Peter Kuznick is cowriting a 10-episode television series called Secret History of the United States with Oscar-winning filmmaker Oliver Stone. It will air on Showtime in 2010. The series will examine underexposed events and figures that have played a key role in the last 70 years of America's history. It will also shed light on new, undiscovered details about well-known topics, such as the Vietnam War and the Kennedy administration. Secret History is the latest collaboration for Kuznick and Stone. The two met in 1996 when the filmmaker visited Kuznick's class, entitled Oliver Stone's America. The course, which has been offered nearly every fall since then, focuses on Stone's influence on both popular and scholarly opinions of recent topics in American history—such as the Kennedy presidency and assassination, Watergate, the antiwar movement, U.S. Policy in Central America and 1960s counterculture—and compares Stone's interpretations of those events with the interpretations of scholars and participants in the events surveyed. Stone has either visited the class in person or conducted a phone interview with the students each time the course has been offered. Kuznick has also written a screenplay for Stone for Lost Cause, an upcoming film about the Cold War. Kuznick's historical expertise includes nuclear issues, film and history, scientists and politics in twentieth-century America, the bombings of Hiroshima and Nagasaki, and the Cold War. He is often referenced by the media on a broad range of historical topics. He has directed American University's award-winning Nuclear Studies Institute since 1995 and is currently serving his second three-year term as Distinguished Lecturer for the Organization of American Historians.